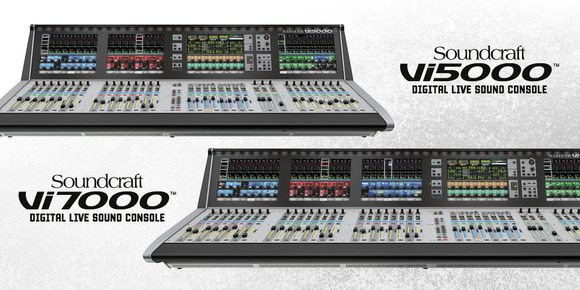 The Vi7000 digital mixing consoles delivers the best Vi sound ever, bringing optional 96kHz processing, upgraded channel counts and even more reliable hardware to live sound's most popular mix interface. Partnering a compact control surface with new Local Rack and Active Breakout box hardware, Vi delivers simultaneous mixing of up to 128 inputs and 32 mono/stereo busses. Pristine sound quality is assured by ultra-low noise mic amp designs and enhanced 96kHz* 40-bit floating point digital audio processing, while FX come courtesy of 8 independent Lexicon multi-FX units, BSS DPR901ii™ integration and a BSS graphic EQ on every bus output. 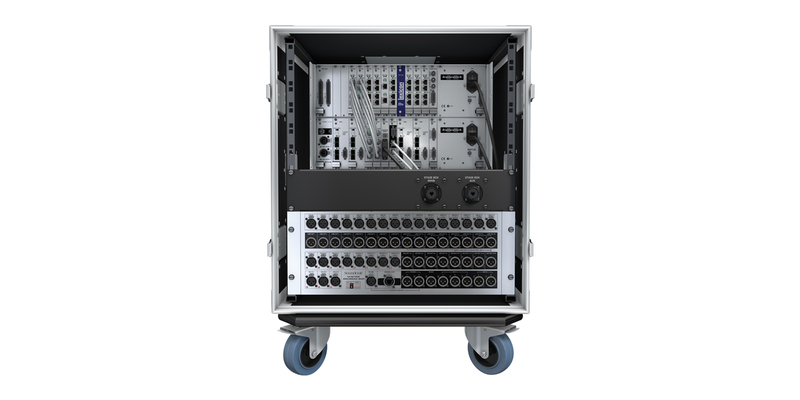 Rapid configuration and powerful automation features, radio mic status monitoring and extensive ViSi Connect I/O expansion (EtherSound™, CobraNet™, Dante™, MADI, etc.) complete the package. Our patented Vistonics was designed from a simple start point - create the most intuitive digital mix interface available. Rather than arranging controls around or adjacent to a flat TFT screen, a system that requires constant hand and eye co-ordination and mental mapping, Vistonics simplifies the process and puts the rotary encoders and switches right on the touch screen. With graphics behind the controls that change depending on the function, the operator is left in no doubt as to what parameter is being adjusted. With the display and relevant controls combined in one area, the operator is immediately presented with a simple, clear mix system that streamlines workflow and enhances the creative process. Each Vistonics interface controls eight input channels and comprises a touch screen with 16 rotary encoders and 16 switches. A simple touch in the desired part of the on-screen channel strip is all it takes to access channel functions including routing, input gain, digital gain trim, delay, high and low pass filters, 4-band fully parametric EQ, compressor, limiter, gate, de-esser and pan, with immediate access to a sophisticated visual status display and straightforward controls. In addition, a dedicated Vistonics II interface is provided for output processing control, and also functions as a complete meter overview display for all 128 inputs and 32 busses, as a snapshot cue list display, and as a display for diagnostics information. 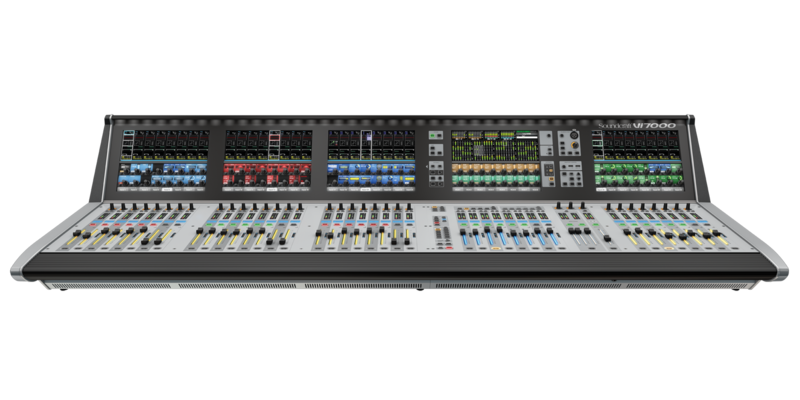 Vi consoles are equally designed for FOH and monitor mixing, with powerful features that makes it easy to mix large scale monitoring applications or deal with the compromises necessitated by mixing FOH and monitors from one surface. 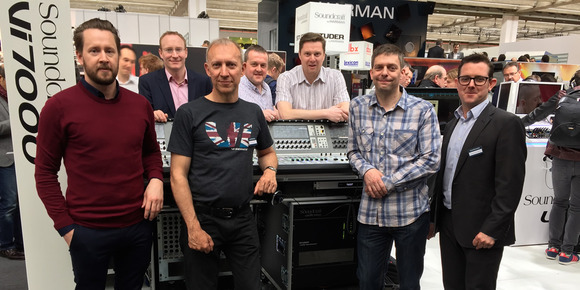 All busses can be turned to stereo without tying up two busses, providing a massive 32 stereo mix capability – perfect for mixing large monitor applications. With a total of 4 aux send pick-off points from the input channel for each send, monitor mix engineers have the flexibility to tailor mixes more closely to performers’ requirements. 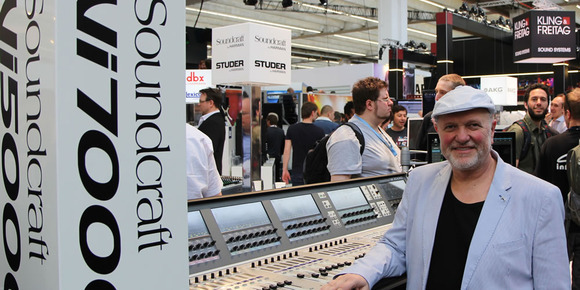 Sends can be pre-EQ, pre-compressor, pre-fade or post-fade on a per channel/per bus basis. VCA master faders can control the aux sends of their member channels on a per mix basis, with FaderGlow illuminating in white to indicate the VCA’s operation on the current mix. Monitor engineers can retain control of important global elements such as ambient mics while also having a monitor mix selected and adjusting groups of sources within the current mix using the Aux-VCAs. Blue illumination of FaderGlow indicates that the VCA is controlling the global channel level to all mixes. Performers using in-ear monitors want to hear the audience between songs? No problem. 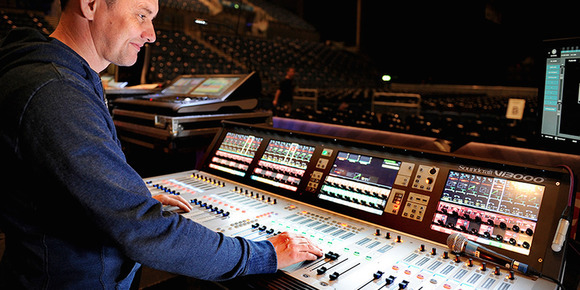 Vi consoles have the facility to externally control the Gate or Ducking processing from a bus in the console, so all you have to do is insert a ducker on an ambient mic with an external source of the LR bus or a spare bus, and the audience level increases automatically when the performers stop playing. You know what it’s like. The radio mics check out fine on the RF Tech’s laptop, but that’s before the talent walks onto the stage. Reception black spots, drained batteries, accidental mutes – anything can happen once the show gets underway. 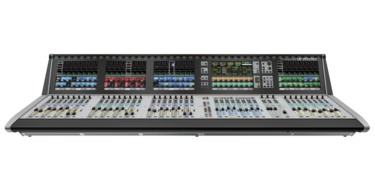 Vi makes the engineer’s life easier, letting you monitor the status of any compatible AKG™ or Shure™ radio mic directly from the Soundcraft® Vi Series console surface, courtesy of VM2 (Vistonics Microphone Monitoring). With realtime visual displays of battery life, RF status, mic muting and internal clipping, you’ll be able to see a problem long before you hear it, right there on the relevant channel strip – with expanded information instantly available just by touching the Vistonics™ screen. And system configuration couldn’t be more straightforward – simply plug in the mics, associate them to the related console channels, and you’re done. 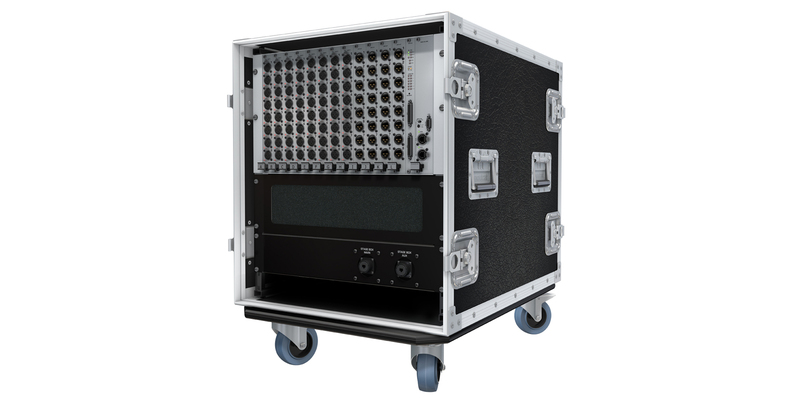 You can even identify the relevant mic receiver in the rack by pressing the Locate button, causing the receiver front panel display to flash. It all adds up to much more efficient workflow and one less thing for the engineer to worry about. Vi5000 & 7000 now feature built-in STUDER vMIX processing, allowing seamless automixing of up to 4 separate groups of 16 microphone channels. 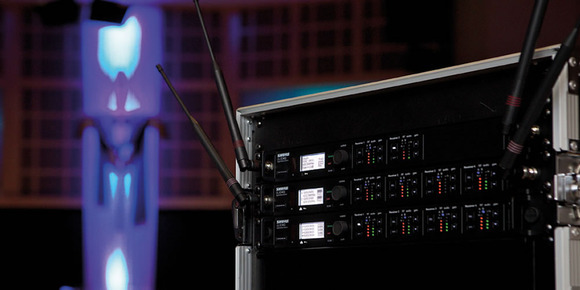 vMIX allows the levels of multiple microphones to be managed to automatically to reduce the gain of any person who is not speaking, whilst keeping overall gain constant and reacting faster than a human hand to the sudden level changes in a dynamic panel discussion. Minimising the need for outboard processing gear, Vi5000 and Vi7000 put class-leading effects and dynamics from Lexicon and BSS directly within the console. 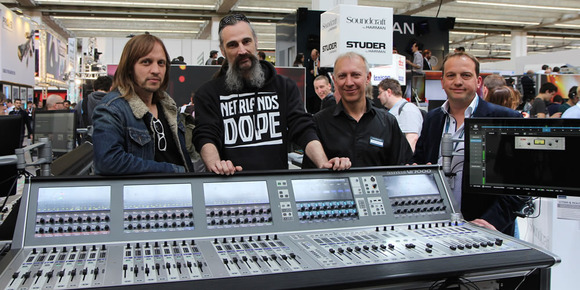 Via the Vistonics interface and FaderGlow surface, Vi provides the perfect vehicle for effects control. No wonder many engineers are claiming that Vi is the only console they would use without any additional processing equipment. The BSS DPR901ii was an industry-standard analogue dynamic equaliser used the world over for its capability as a powerful tool for awkward corrective tasks. A unique feature of the DPR901ii was the under/over threshold switch on each band, enabling the equaliser to react in either cut or boost mode to correct problems that occur only on loud or only on quiet signals. The Vi5000 and Vi7000 bring the world’s first accurately modelled version of the original analogue unit, to the digital domain. 16 instances of this classic processor are available via the console’s insert pool to use as required. In addition to the BSS DPR901ii, there’s also a BSS third-octave Graphic Equaliser on every bus output. The Equaliser is modelled on the BSS960 analogue unit and includes a global Q adjustment allowing narrow bandwidth for stage monitor applications, or wider Q for system tuning on the main outputs. Vi puts powerful Lexicon effects at the hands of the operator via the Vi Series Processor Card. The card empowers the console with 8 independent stereo Lexicon multi-effects units - each providing 14 reverbs, 7 delays and 8 pitch shifting effects, patchable to input channels, aux outputs and channel inserts. 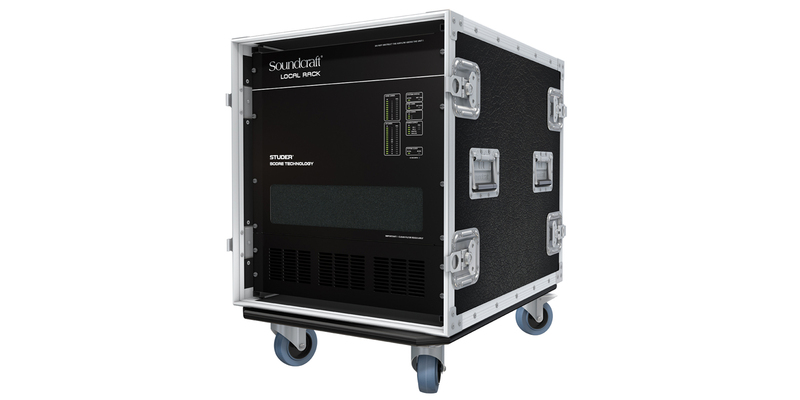 Answering the call for high-fidelity ‘off-the-record’ studio processing at live events, Soundcraft® Realtime Rack unlocks a world of creative possiblilities by placing Universal Audio’s acclaimed analogue audio processing emulations and award- winning UAD Plug-Ins seamlessly within your mix environment. Realtime Rack software gives Vi console operators all the control they need to insert UAD Plug-Ins on individual channels, auxiliary channels, and master busses – just as easily as real hardware. Control of the plug- ins is via an intuitive and responsive external touchscreen interface. A comprehensive snapshot system allows total recall of all plug-ins and their settings, while tight network integration with the Vi Series ensures that all settings of the application are stored inside the console. Two versions are available: The Realtime Rack Ultimate Live with 74 plug-ins, and the Realtime Rack Core Live with 14 plug-ins. Additional UAD Plug-Ins can be purchased any time from UA’s Online store. The UAD Powered Plug-Ins platform offers the world’s most authentic analogue hardware emulations and award-winning audio plug-ins. Powered by Universal Audio’s DSP Accelerator hardware, UAD Powered Plug-Ins deliver rich, analogue sound quality that would be difficult or impossible to achieve with native plug-in host systems. From rare compressors and equalizers, to vintage reverb processors and tape machines, UAD Powered Plug-Ins inject three-dimensional ‘out-of-the- box’ analogue sound to your mixes. 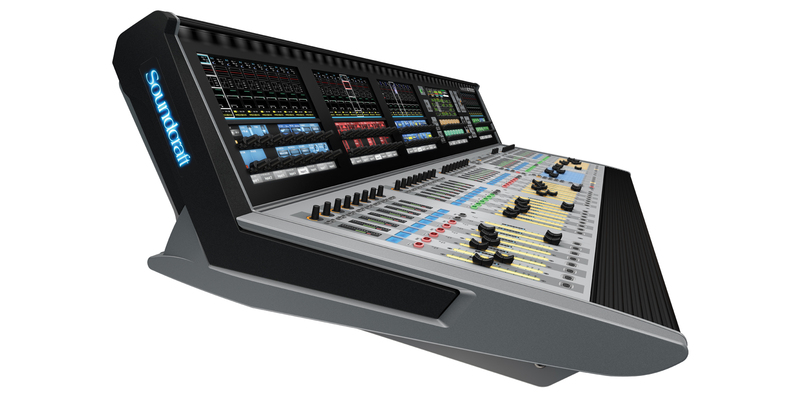 The factory-designed flightcases for the Vi5000 and Vi7000 control surfaces include rack space and fittings to allow integration of up to three Realtime Racks, a Mac Mini computer for control and provision for storage and mounting of an external touchscreen monitor. Metering Internal 20-segment LED bargraphs plus 9-segment gain reduction meters for all inputs and Outputs. Peak hold variable from 0-2s.